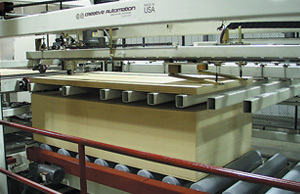 Custom Feeding Stacking Machinery for Wood Manufacturing Material Handling and Processing Applications – Creative Automation, Inc.
At Creative Automation, we have built hundreds of feeding and stacking machines. All are designed to customer specifications and range from small portable units up to large gantry systems. Types include vacuum, clamp, drop angle, fork, cookie sheet and rake arm. Below are selected examples. 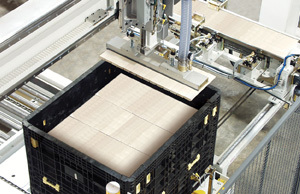 This automated countertop stacking system utilizes five pick and place carriages. Closeup of one of the high speed servo-driven 4-axis gantries. 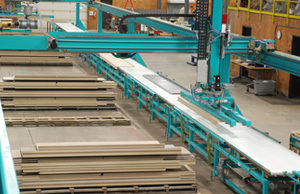 Two gantries work simultaneously to stack countertops coming off the line. 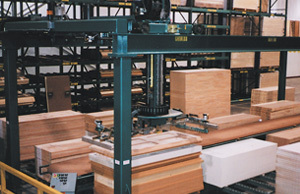 Servo-driven stacker handling cabinet components. 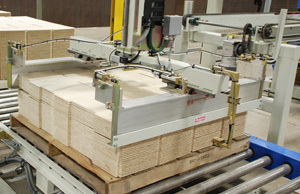 Servo-powered core feeder and sheet feeder carriages perform door layup. The core feeder can easily handle heavy lead lined cores. 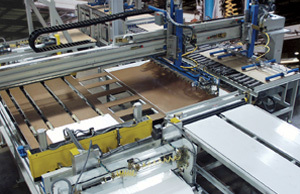 Automatic feeder and infeed conveyor, feeding door skins into a gluespreader, as part of a door layup operation. 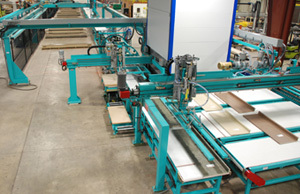 Three axis gantry feeders/stackers can be built to service any number of stations. 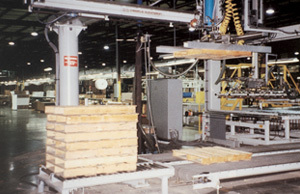 Multiple stacks of siding are collected into a layer and the drop angle stacker places the layer on the pallet. System laying up laminate and cores prior to a hot press. 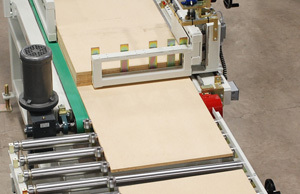 We offer equipment to automatically feed/stack various types of pallets or cull boards. 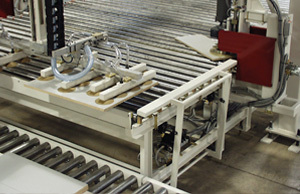 Rake arm panel feeder with intermediate forks for uninterrupted, high speed flow. 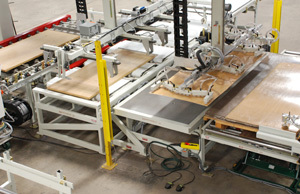 Servo-driven stacker placing cabinet door stiles and rails. 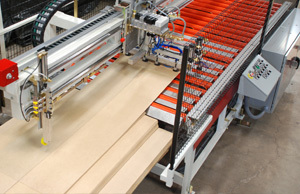 Belt feeders are a cost effective method for taking panels from a panel saw and feeding them into an edgebander.